Mrs Temple’s Alpine (also known as Wells Alpine) is a pasteurised, semi-hard cow’s milk cheese, produced by Dr Catherine Temple of Copys Green Farm and made on the Holkham Estate (I know this place well, not for cheese reasons but because I have a hilarious memory of my Other Half frantically cycling away from a horse which had taken a passionate fancy to his bicycle). Catherine grew up on a Nottinghamshire dairy farm, the milk going to a local Stilton co-operative. Her grandmother and mother both knew how to make cheese and butter and passed on their skills to Catherine but she originally trained as a pharmacist. It was whilst volunteering for a mission in India that she first got a craving for cheese, when a lack of it caused it to become her ‘fantasy item.’ But it was only in 1999, when she and her husband returned from working in the tea business in Malawi and moved to Norfolk, that actually making cheese became a possibility. With farming in recession and dairy farmers looking for ways to diversify their income, she began to make cheese from her father-in-law’s herd of Friesian Holsteins, having spotted a gap in the Norfolk market for a cow’s milk cheese. The first experimental cheese was a cow’s milk mozzarella but fifteen years later and they produce a range of acclaimed cheeses, whilst Catherine still juggles cheese-making with lecturing and working at local pharmacies. The idea for making an Alpine cheese came to Catherine whilst she was on a cycling holiday in The Alps and loved the local cheese. The farm now has its own herd of Brown Swiss cows, imported from Bavaria and Austria, which provide the milk for the Appenzeller-style Alpine cheese. They grow their own animal feed to connect the animals to the land – a mix of maize, grass, silage, chicory and beet. 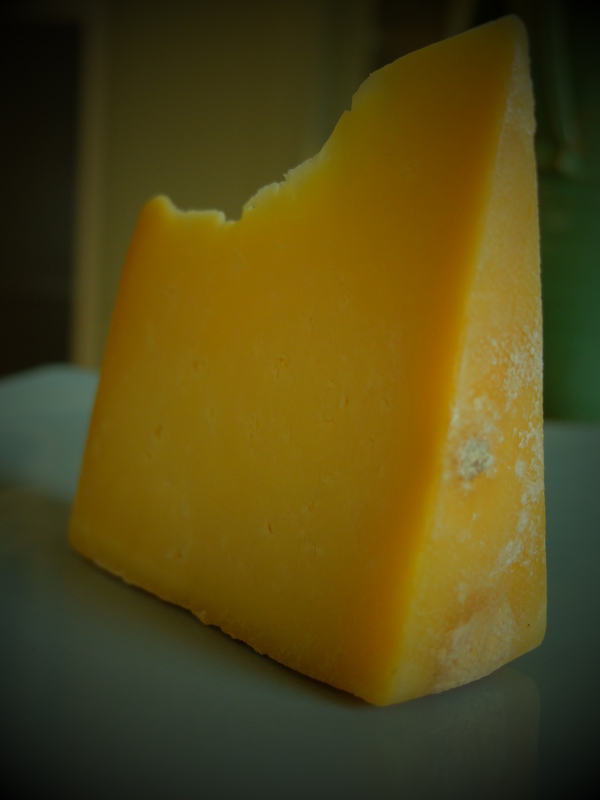 Wells Alpine is made to recipe similar to a Gruyère and matured for six to nine months. It’s a supple cheese, slightly bendy like its Alpine cousins across the Channel. Taste-wise, it’s everything you would hope for from a mountain cheese: sweet and nutty with a pleasant tang. And I searched high and low, through paste and rind, to find a maggot but I’m pleased to report that the dairymaids of Norfolk appear to have turned a corner in the last two centuries. Additional research from Food and Travel, Delicious Magazine and Whey More to Norfolk. I reckon you did take a bite out of it but nevermind. Tangy, sweet and nutty, good stuff. Mrs Temple’s cheeses are excellent, sampled some of them the other week at the North Norfolk food fest at Holkham Hall. Lovely day out if you’re in the area next year. Phew! No maggots then. Relieved because even I do not love cheese that much!